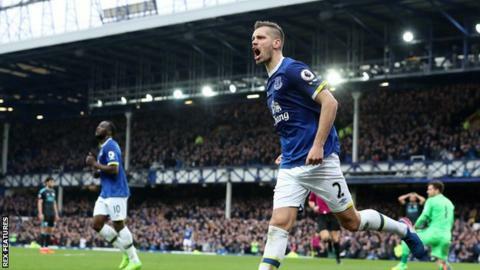 Morgan Schneiderlin scored his first Everton goal against the club that tried to sign him as the Toffees cruised to victory over West Bromwich Albion at Goodison Park. Kevin Mirallas put Everton on course for a fifth successive Premier League home win when he tucked home after Ben Foster had parried Ross Barkley’s shot. Schneiderlin, whom West Brom tried to sign in the January transfer window, doubled the lead after clipping the ball past Ben Foster, following a fine turn and pass by Romelu Lukaku. Lukaku sealed the points when he headed Ross Barkley’s cross past Foster, marking the Everton striker’s 19th league goal of the season. Everton remain seventh, two points behind sixth-placed Manchester United, who have two games in hand, with 10 matches left for Ronald Koeman’s side. Seventh could be sufficient to make it into the Europa League third qualifying round, depending upon who wins the FA Cup. Everton now have a seven-point cushion over eighth-placed West Brom, who showed little fight after Mirallas pounced in the 39th minute, capping a fine move started by Lukaku. Ross Barkley was used in a free role by Ronald Koeman. He had six shots during the game – one more than the whole West Brom side. This touch map illustrates his impact in the Baggies’ half. Schneiderlin added a second six minutes later – his first Premier League goal since scoring for Manchester United against Everton in October 2015. Lukaku sealed an easy win with his 19th league strike of the season, which takes him level with Tottenham’s Harry Kane at the top of the Premier League scoring charts. There was still time for substitute Idrissa Gueye to hit a post in front of boxer and Everton fan Tony Bellew, who was guest of the club one week after his win over David Haye. West Brom need 10 more points from 10 games to beat their Premier League points tally record – set in 2012/13 when they reached 49 – but the Baggies looked like a team with little to play for in Tony Pulis’ 300th game as a top-flight boss. They managed just two shots on target as the flair and creativity that brought them away wins at Leicester and Southampton earlier in the season deserted them. Home keeper Joel Robles did well to keep out Nacer Chadli’s strike from outside the area moments before Everton scored. But Albion lacked ambition as they served up a dire performance for their 1,800 travelling fans. Romelu Lukaku produced another action-packed performance. He was involved in the first two goals before using his head to score the third goal. Everton boss Ronald Koeman: “It was an outstanding team performance. In the second half, we controlled it. Our defensive organisation from set plays was outstanding. “We will always score because we have those types of players. Normally Romelu Lukaku will score in every game. But you need to fight, defend and run. The pressing in midfield was outstanding. West Brom manager Tony Pulis: “Conceding the two goals before half-time killed us. Before that we were in the game. “Romelu Lukaku and Ross Barkley were outstanding. We created some opportunities. Our biggest problem in the last couple of weeks has been the little bit of quality we need with a final pass or shot or cross. Everton had that. Romelu Lukaku is improving year after year and he is still only 23. He is powerful, good in the air, and can finish with both feet. He is ambitious, too. Everton have to match that ambition and succeed, because if they don’t, he will leave. Morgan Schneiderlin is the final bit of the jigsaw for Everton. With all the great players they have in front – Ross Barkley, Romelu Lukaku – somebody has to be the feeder and do the work in deep positions. But Schneiderlin also wants to pass and make things happen, he is an all-round player and will score goals, too. He was told he wasn’t good enough at Manchester United but he is good enough for Everton certainly. His lift over the keeper showed he can play. West Brom have not kept a Premier League clean sheet on the road since the first game of the season at Crystal Palace, conceding in each of their last 13. Everton have won five consecutive Premier League home games for the first time since April 2014 (a run of seven). Romelu Lukaku has been involved in 24 Premier League goals this season (19 goals, 5 assists) – only Alexis Sanchez has been involved in more (26). Indeed, 19 goals is the Belgian’s best return in a single Premier League campaign. Ross Barkley has provided an assist in consecutive Premier League games for the first time since November 2015. The Toffees have already equalled their Premier League points tally from each of the last two full seasons (47). Both teams are at home next Saturday in the Premier League. Hull City will be tasked with preventing a sixth successive Everton home league win (15:00 GMT). Arsenal are the visitors to the Hawthorns earlier in the day (12:15 GMT).